Programming Ease: Most applications use old MS-DOS or some of the industrial variants. More powerful 32bit versions can work directly with Windows or Linux. Software Tools (compilers, Linkers and Cross Assemblers) are widely available at relatively low-cost, since their use is standard in normal PCs. Good quality development tools for other processors are generally extremely costly software packages. A complete Real-Time Operating System, or a more simple Real-Time Executive with Multitasking capability can be integrated easily. This last alternative does not replace DOS, but adds multiple tasks and a predictable execution time. 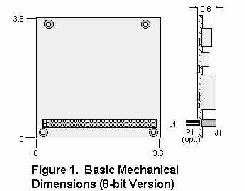 The physical characteristics of the PC/104 (8 bit version) are standarized and as shown in the above Figure 1. Dimensions are given in inches (3.8" x 3.6" x 0.6"), or in mm of 96.52 x 91.44 x 15.24. 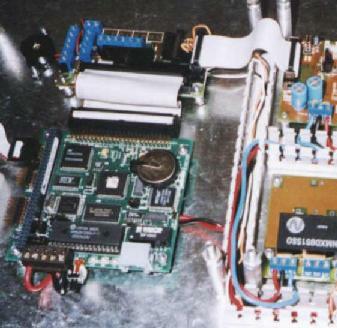 Figure 2: Micro/Sys CPU board project. 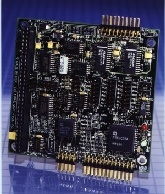 The special format of these boards allows them to be "piled up", avoiding costly backplane boards and rack mounting systems. Alternatively, the boards can be normally connected in a flat surface (figure 2). 1. A Watchdog Timer, which resets the CPU in case a software malfunction occurs. RTC (Real Time Clock) hardware, sometimes with wake-up capability. operation. This sometimes includes extended temperature ranges of -40 to +85ºC. Please mail us for further information, availability and pricing of PC/104 systems at L&R.